Summary: Health Faster, Heal Smarter with Actipatch. Actipatch Therapy is a clinically proven, drug free, pain and swelling relief that accelerates healing of soft tissue injuries. With Actipatch, there will no longer be painful swelling, no more ice packs, no more messy creams and ointments and best of all, heals faster while you sleep. 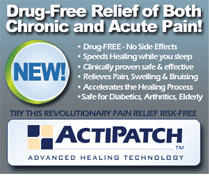 Get a free 14 day free trial to Actipatch Therapy today!